When a child receives a diagnosis like learning disability, attention deficit disorder, cerebral palsy or autism, parents and professionals truly want to help. Medication, behavioral strategies, therapies and tutoring are the most common ways that come to mind. While these approaches are usually helpful, it eventually becomes apparent that they are not addressing the root of the issues. It can be a confusing and disheartening process for the parents and children involved. At Pathways Treatment Center, we strive to help parents understand what is at the base of the child’s difficulties, and work towards remediating those issues. In human development, it’s all connected. Brains develop the body, and the body develops the brain. Motor development impacts cognitive development, and cognitive development impacts motor development. A young baby who has the motor skills to reach and grasp gains cognitive skills by grasping and exploring different objects. Babies are like little scientists, experimenting with things in the environment. Shaking, mouthing, dropping objects with delight. All of it is important and inter-reliant. As complex movements become possible for the child, interactions and relationships with the environment and others become more complex. When the baby learns to crawl, her range of exploration grows exponentially. She begins to explore new territory and experience her first acts of true independence. These small acts of independence create the roots of self-development. She begins to discover her what she can do. She begins to learn through her own experiences. While she is exploring, her central nervous system brings more and more information her brain, raising awareness, linking abilities and gaining experience to integrate into her mind. Language, cognition and social-emotional development are directly dependent on these experiences which stem from motor development. In turn, these mental processes provide the curiosity, resilience and motivation to specialize and progress into more motor development. It is a simple, yet complex cycle that leads to typical development. One that most of us take for granted and rarely need to think about. So where does it all begin? As early as 4 weeks gestation, fetal movements known as “archetypal movements” begin the cycle of motor/brain development. These movements are present universally and are the beginnings of the primitive reflexes. At birth, babies react to sensory stimuli by moving in predictable ways. These unconscious movements are known as primitive reflexes and serve very important developmental purpose. Primitive reflexes lay the groundwork for the body’s postural control, orientation in space and protection from danger in the environment. For example, when a baby hears a loud, unexpected noise, her arms will move briskly back and then forward. She will then begin to cry. This is known as the Moro Reflex and will serve as a protective reflex for the rest of her life. As she continues to mature, her Moro Reflex will integrate as a basis for safety and regulation, allowing her to develop cognitively. Her Moro Reflex will be present only in the face of big, overwhelming sensory input, keeping her safe through “fight and flight”. You can imagine a sudden, loud noise or big touch and how your own body responds. This is your Moro Reflex reacting for protection. Through sensory input (auditory, visual, tactile or proprioception) information is delivered from the central nervous system to the brain, which in turn tells the body to move without thought or planning. When that information is big or dangerous, our brain knows to react immediately to keep us safe. The system is so complex, it is amazing how smoothly it works for people. Information comes into the system in many ways. One way is through our sense of touch. Our skin, which is the largest organ of the body, houses the tactile system. Within the tactile system, eleven different types of cellular receptors bring different sensations to the central nervous system. Information about temperature, texture and pressure comes through to the central nervous system, and the brain automatically responds keeping us safe from harm. If even one of those types of cellular receptor groups is hyper or hypo responsive, the information delivered to the brain is changed. 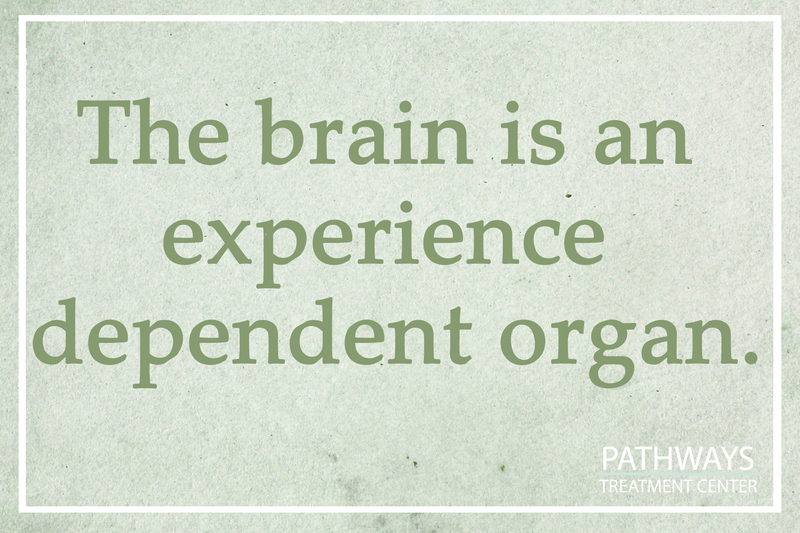 And the brain is an experience dependent organ. Organization of the brain comes from that input. Protection and safety is dependent on that input. Disorganized brains create disorganized minds, which then receive diagnoses like Attention Deficit Disorder, Hyperactivity, Learning Disabilities and Autism Spectrum Disorders. People who receive these labels are very likely to have some disruption or differences in the very complex system of sensory/motor/cognition cycle. The good news is that this development can be influenced through therapeutic intervention. Systematic, reliable information can be provided to the central nervous system. Re-patterning of motor response can be delivered. Cognitive processes can be influenced indirectly and directly. 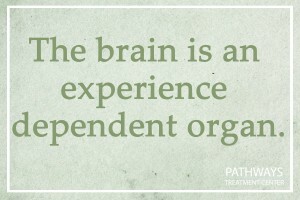 The brain is an experience dependent organ. At Pathways Treatment Center we believe that parents are the child’s best resource for influencing body/brain development. We use the Masgutova Neuro-sensory-motor Reflex Integration (MNRI) Program to systematically activate and integrate the sensory input to the central nervous system and re-pattern the motor response from the brain. The MNRI is a highly effective brainstem re-patterning program that helps the brain to organize around the basis (Primitive Reflexes) for regulation and learning. We also use the Relationship Development Intervention (RDI) Program to train parents to guide their child’s cognitive and social-emotional development.